IDEAS LADY: Jordan McGregor with son Hunter. Jordan has been nominated for a Queensland Young Achiever award. IPSWICH mum Jordan McGregor's efforts to create environmentally friendly cloth nappies has earned her a nomination for the Queensland Young Achiever Awards. Made using organic hemp and bamboo inserts so they are durable and washable, Mrs McGregor's products have the potential to save parents thousands of dollars per baby - and the earth thousands of nappies in landfills. The business has generated $75,000 in revenue in its first seven months of operation, prompting international investors to request partnerships with Bare and Boho, her company. Perhaps more importantly, Mrs McGregor hopes her recent nomination for the Young Achiever Awards will encourage other young mums to put their ideas into action. "It is great exposure for the business, but even more importantly, I hope this recognition will encourage other mums to put their ideas into action," she said. 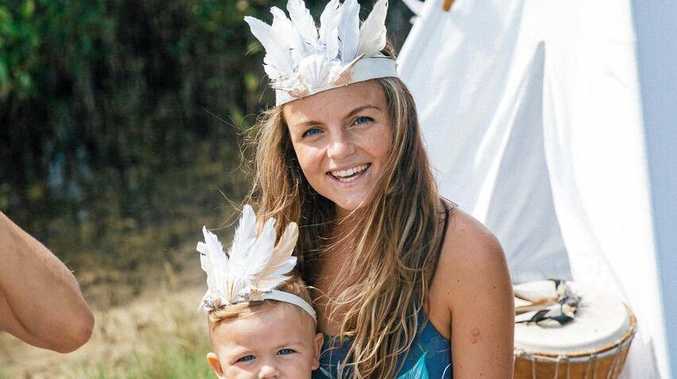 "It's great to be part of a growing community of mums that want to design products that help other families"
The idea behind Bare and Boho came after the birth of her son. "He's two-and-a-half now," she said. Mrs McGregor wanted to use nappies that would be kind to her baby, the environment and her purse. When she searched at supermarkets and online, the products she found did not fulfil her criteria, so she designed some herself. These products exhibit alongside leading eco-friendly baby brands at natural health shows. Mrs McGregor will be heading to Sydney this weekend to showcase her products at the Pregnancy, Babies and Children's Expo. She said she will be displaying her range of "reusable cloth nappies. She said these nappies are "cost effective and help the environment." Bare and Boho is set to release a range of sun protective accessories this year. These include hats, rashies and toddler training pants that patch the original cloth nappies.